Hi again, everybody! ‘Hall Of Shame’ continues! Claims regarding the actual production of language by children in their first few months of life have always emerged as suspect or worse on analysis (this includes David Oates’ special claims regarding ‘Reverse Speech’ as allegedly produced by infants). In contrast, some self-proclaimed psychics sidestep the evidence involving actual speech and assert that they can communicate TELEPATHICALLY with babies. The skeptical psychologists Chris French and Krissy Wilson tested the ‘powers’ of one such person, David Ogilvy, the ‘baby-whisperer’, in 2007. Ogilvy also took on the James Randi Challenge. In both cases he failed to demonstrate any abilities in this area. There are other claims regarding mysterious linguistic material involving older children. One such case involved triplets who abbreviated and modified English words when communicating with each other and at one stage intoned their utterances as if using a language with phonemic tone such as Chinese. Cases are also reported of teenaged and older couples developing ‘secret languages’ – although– like other ‘languages’ invented/concocted by non-linguists – these often consist very largely of novel vocabulary items and are unremarkable in phonological and grammatical terms. One such case involved a teenaged lesbian couple in Melbourne, Australia in the 1990s; one of the women instructed the other in satanic ideas and an accompanying private vocabulary. There are cases of groups of deaf children apparently inventing new (but wholly orthodox) signed languages. The maverick amateur Liam Jones (discussed last time) deflects critical questions by likening himself to the 20th-century English philosopher and populariser C.E.M. Joad, who used to commence his analysis of amateur proposals and queries (e.g. on radio shows) by asking for the background assumptions behind the discourse – and hence the key aspects of its meaning – to be made explicit. Jones asks professional linguists and philosophers to apply this approach to their own questions regarding his obscure statements; he declines to respond to these questions unless this is done first. But these questions are, typically, already as ‘paradigm-free’ as possible, making the minimum of assumptions. And Jones’ own material is largely unintelligible in the absence of answers to these questions. This is special pleading on a grand scale. Even more judicious and astute authors who endorse non-mainstream claims sometimes seem to assume that positive reports on the outcomes of experiments or other studies (for example, reports made by the investigators themselves) are veridical. For instance: in his tribute to the polymath and parapsychologist Archie Roy (Seriously Strange [Association For The Scientific Study Of Anomalous Phenomena] 142 (2013), pp. 14-15), Hugh Pincott says that Trish Robertson and Roy demonstrated beyond reasonable doubt that the ‘messages’ from alleged deceased persons in question in their studies were more relevant to intended recipients than others. Now Pincott is fully entitled to his own assessment of what R&R demonstrated – but surely his wording should have acknowledged that skeptical commentators on R&R do not accept their own very positive interpretations of their results. Even if he believes that he could overturn the skeptical objections, or indeed that they have already been overturned, it would be reasonable to mention that they have been raised. (Of course, no-one is saying here that R&R MANIPULATED their data.) One would hope that writers of all views on such matters would acknowledge thoughtful disagreement. More ‘Hall Of Shame’ at the weekend! Melbourne-based Jones sent his treatises on language to various linguists including me; I was the only one who was game enough to respond at any length! Jones’ ideas involve proposed novel, large-scale theories about the nature of language, strikingly different from generally-held mainstream ideas and developed on the basis of a very limited knowledge of the discipline. In Jones’ case this involved some acquaintance with Chomsky’s thought, which he had however seriously misunderstood. His structural and sociolinguistic terminology is very different from mainstream terminology and does not seem to relate closely to the latter; it is mostly left unexplained, as if it is supposed to be already familiar or readily grasped on first exposure (some amateur philosophers in Australia proceed in similar ways). This also applies to many of Jones’ proposed non-mainstream analyses and theoretical claims, which imply many unannounced and unexplained assumptions. He declines to explain his terminology, apparently believing that he needs to avoid mainstream terms in order to make novel points and that the onus is upon his critics to determine his meaning as best they may. One ‘Chico’ appeared on an atheist bulletin-board, saying: ‘Nothing fails like prayer? As a linguist with a strong faith in the delusional linguistic common, as a positive phenomenon, (which actually works as an illusion), but fails miserably as a tool for value, this statement as to the failure of prayer, disturbed me deeply. As usual when confronted with linguistic phenomenon, I began a lengthy search into formulation of my conceptualization. I am happy to report, I found this statement to be absolutely truth, and have found the truth to be a linguistic positive, due to the fact, language is a delusional, illusion. It is not real, and therefore, requires failure to eliminate most all positives, and nearly all the negatives as well. It prevents sensory overload, and prevents drowning in linguistic immersion’. A request for clarification proved fruitless; ‘Chico’ responded: ‘The concept of illusion is greeted in the same manner as music, the concept of delusion is greeted the same as language. All four are illusion! This is a constant known as the four basics’. He ignored a further enquiry. ‘Forrester’, a contributor to skeptical bulletin-boards based in the USA, has adopted a peculiarly mixed stance in respect of Chomskyan linguistics. He rejects Chomskyan theories concerning Universal Grammar as not fully supported by the evidence, but he does accept certain features of UG (as he understands it) as applying to all human languages (and indeed, quite contrarily to Chomskyan views, to the communication systems of higher non-human primates also). He also argues (loosely) for a close link between the acquisition of these features and that of accurate perception and hence successful manipulation of the physical world, on the ground that UG reflects the relationships between entities in the world. This view seems to be at least overstated. One of the features of UG which Forrester accepts is the Subject-Verb-Object system of functional units in clauses. Interestingly, Chomskyans do not actually use these terms in their own versions of UG; instead of identifying some Noun Phrases as Subjects, they define the relevant NPs as the NPs involved in the basic clause construction NP+VP (= Subject-Predicate) and describe what other linguists call Objects as the NPs involved in the secondary construction V+NP within the VP. There are, of course, linguists (non-Chomskyan) who do talk in terms of Subjects and Objects (as basic functional units of clauses); but these linguists are often typologists and generally do not accept UG as genuine. Forrester himself clearly holds that ALL human languages actually have Subjects, Verbs and Objects; but this does not seem to be the case (‘ergative’ languages such as Basque resist analysis in these terms). The proposed spelling reforms of ‘Tom Hardwyck’ (not his real name) have been featured in The Australian newspaper and elsewhere. His system is basically phonemic, with all the usual issues (of which he is apparently unaware; he writes as if he were the first to consider these matters). Hardwyck’s attitude to scholarship is one of determined ignorance and belligerence. One critic of Hardwyck, Nick Wade, is himself utterly naive in sociolinguistic terms and apparently wants to ‘reform and unify’ pronunciation so that spelling reform will then be ‘easy’. I am struggling to relate this intemperate comment to what I said in ‘Hall Of Shame’ 10. Unless someone can persuade me that any of my statements there are out of order in any way, I don’t see any need to modify or withdraw my comments or to refrain from further comments on these issues. As I hope is clear, I am wholly respectful and sympathetic with respect to deaf people or anyone else with any kind of disability (naturally, I have my own shortcomings and hope that others will treat me too with respect and sympathy), and I am positive about any efforts made by deaf people to improve their situation. But this does not imply that I must accept EVERY proposal along these lines as helpful. Addendum: there is of course now a very welcome option to view signing (in various languages) on many TV shows. One of the Deaf leaders is Paddy Ladd, who was a fellow linguistics student of mine at Reading some 30 years ago. In 2008 Ladd expounded his views in the book Understanding Deaf Culture: In Search of Deafhood, based on his PhD thesis and reviewed online by Dale Mellor; for further summary comments, see Margaret Macmillan’s 2010 book The Uses And Abuses Of History (pp. 60-61). While Ladd is very informative and has much to say that makes excellent sense, he does seem at times to adopt an exaggerated stance on this issue. Mellor is himself effectively deaf and found himself adversely affected during his early life by the older ‘oralistic’ attitudes; but, as he says, Ladd treats the Deaf community rather as a ‘law unto itself’, going so far as to argue that parents are wrong to have their deaf children fitted with cochlear implants (rather than hearing aids) so as to facilitate their life in the wider community. There is a (presumably unintended) echo of the ‘glad to be disabled’ syndrome here. Deaf people do need to live in a largely non-deaf world; and it is unlikely that very many hearing people will learn signed languages to fluency for the purpose of interacting with others who mostly know the relevant spoken language well and can nowadays be given adequate hearing (without abandoning the asset of an additional, signed community language). And isolation from the hearing world – even if with international links to other Deaf cultures – is neither feasible nor, surely, desirable (although this notion has been explored, notably in some science-fiction). Mellor suggests that nobody has ever tried seriously to invent written forms of signed languages. However, this is not the case; see http://www.signwriting.org/index.html, etc. These systems seem not to be as prominent as they arguably ought to be, and their further development and promotion would benefit those who prefer to function in signed languages where possible. Ladd has also argued that autistic people, similarly, should not be seen as disabled; the validity of this view seems to depend on the degree to which their autism affects their ability to interact with the community at large. Hi again, everybody! ‘Hall Of Shame’ continues (a short one this time)! Scott Alan Roberts’ work is in most respects typical of ‘pseudo-historical’ treatises dealing with the ancient world and incorporating some linguistic considerations. His book The Rise And Fall Of The Nephilim (2012) commences with a fairly typical much-overstated broadside against skeptics and unsurprisingly deals mostly with Roberts’ non-mainstream ideas concerning the ‘Nephilim’ (the mysterious ‘giants’ referred to in Genesis). However, Roberts’ work also features an unusual linguistic quirk: he presents the relevant Hebrew data in a VERY strange manner! Hebrew is written from right to left, and usually with the ‘vowel-points’ introduced around 700 CE; when quoting from earlier sources, Roberts cites it in this form. But when citing Hebrew on his own account, he reverses the letter-order. Thus the words read from left to right, making them appear utterly bizarre to those who know Hebrew (as if the English word giants were spelled stnaig). And Roberts does not transliterate his cited Hebrew into Roman letters for the benefit of his non-Hebraicist readers (surely the vast majority); one therefore wonders why he thought that (inconsistently) adopting a left-to-right ‘ductus’ would be useful. He also omits the vowel-points, AND (by way of sheer error?) some of the letters themselves. At any one time, I am working on a couple of skeptical projects, most of which involve some sort of writing component, so I am always on the lookout for new material. Last month, in the class I am teaching about researching and writing about extraordinary claims, a student decided that he was going to look into medical quackery, and we brainstormed about topics that he could look into at the library. As we sat in the computer lab, I started entering some terms into the university databases, looking for a source that might give my student a head start on the research. When I entered “phrenology” into the search box, I was surprised not only by how much came back, but especially by how much of it came back from journals in the humanities, especially in literature and history. I honestly knew next to nothing about phrenology, so I saved about 20 full-text articles with phrenology in their titles on the off chance that I would have time to look at them in depth later. Sifting through these articles, I was struck by the impact that phrenology managed to have on American culture. Phrenology came out of the work of German doctor Franz Joseph Gall in the first two decades of the 19th century, and was popularized in the United States in the 1830s by a well-known physician named Charles Cardwell. I was surprised to learn from Robert E. Reigel, writing in the 1930s, that the earliest phrenologists were respectable physicians who had derived their theories by employing the empirical tools of observation and measurement to the psyche, even if the conclusions were uniformly unrevealing. 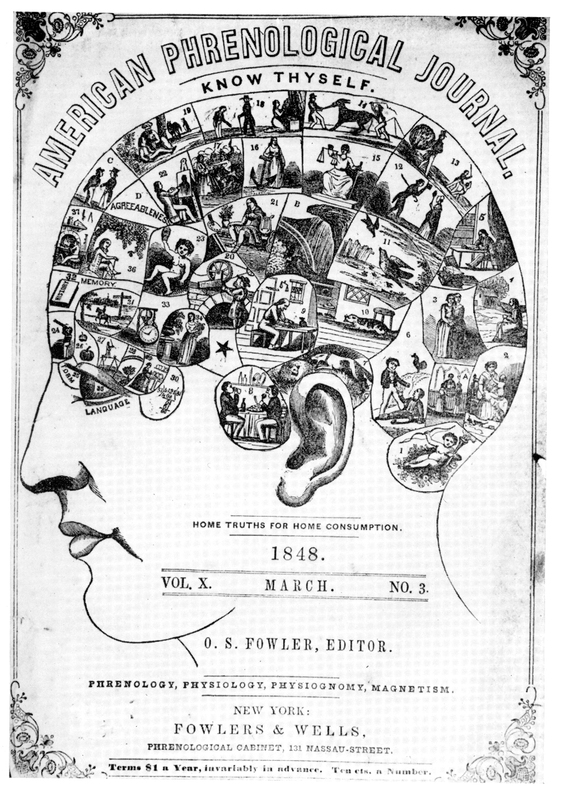 The thought behind phrenology seems to have followed as such: that the brain consisted of modular faculties that were generally independent and localized, an observation that would have been supported through observations of traumatic injuries like the one received by Phineas Gage in 1848, whose personality changed radically when his left frontal lobe was largely destroyed by a railroad spike. 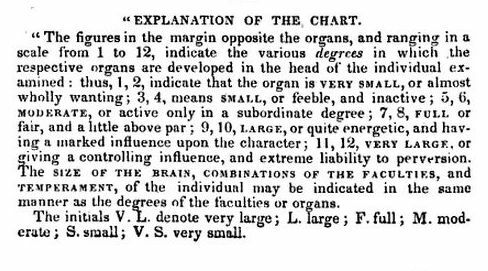 It seemed not implausible that if mind and brain were deeply intertwined that the size of these various organs in the skull might determine one’s personality. And if the shape of the brain determined the shape of the skull, well, could one not possibly infer the personality traits of the individual from an examination of the contours of the head? Sure there are a lot of speculative leaps in there, but it’s not impossible. It could have been right. It just happened to not be, and quite quickly the interpretive flaws that doomed phrenology were recognized. 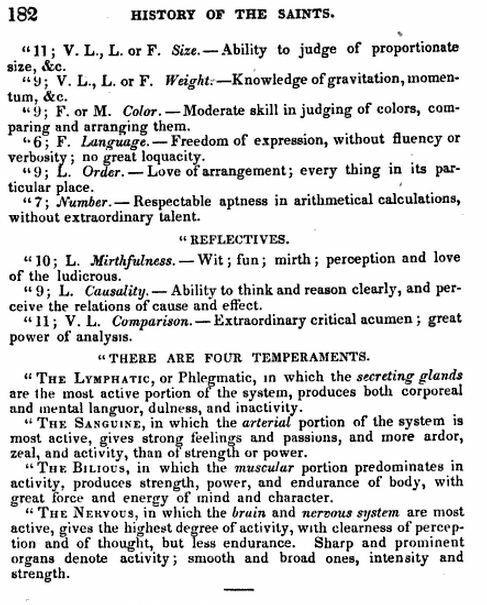 Phrenology, while in some ways reflecting a materialist sensibility about the origin of character, was also a very convenient tool by which to confirm racial and social stereotypes and beliefs that one’s true inner nature would be written on one’s body, like Dorian Gray’s portrait. As such, it was an especially useful pseudoscience for reconfirming the inferiority of darker races and confirming the inherently criminal nature of the lower classes. The phrenologist took great delight in mouthing [the] great names [of cranial features]; they gurgled from his lips in an easy and unembarrassed stream, and this exhibition of cultivated facility compelled the envy and admiration of everybody. By and by the people became familiar with these strange names and addicted to the use of them and they batted them back and forth in conversation with deep satisfaction– a satisfaction which could hardly have been more contenting if they had known for certain what the words meant. “It is not at all likely, I think, that the traveling expert ever got any villager’s character quite right, but it is a safe guess that he was always wise enough to furnish his clients character-charts that would compare favorably with George Washington’s. It was a long time ago and yet I think I still remember that no phrenologist ever came across a skull in our town that fell much short of the Washington standard. Twain also recounts a visit to a London phrenologist, once under a fake identity, and then again several months later under his own nomme de plume. He found that the two readings in no way matched, and that the second one was clearly far more specifically tailored to his public persona. I will include a detailed phrenological reading of Mark Twain that found–surprise, surprise–that he was very funny indeed. Have you learn’d the physiology, phrenology, politics, geography, pride, freedom, friendship, of the land? its substratums and objects? Further, Whitman published his phrenological readings by Lorenzo Fowler in several editions of Leaves of Grass. For all its misuses and silliness, phrenology seems to have nonetheless left its mark on American culture. Indeed, at least a basic understanding of the pseudoscience is essential to understanding one of America’s most important literary works. Bennett, John C. The History of the Saints: Or, An Exposure of Joe Smith and Mormonism. 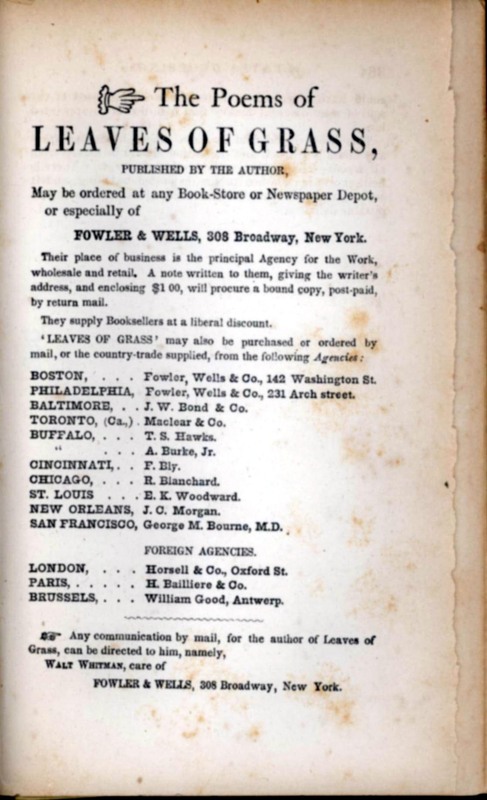 New York: Leland and Whiting, 1842. Claggett, Shalyn. 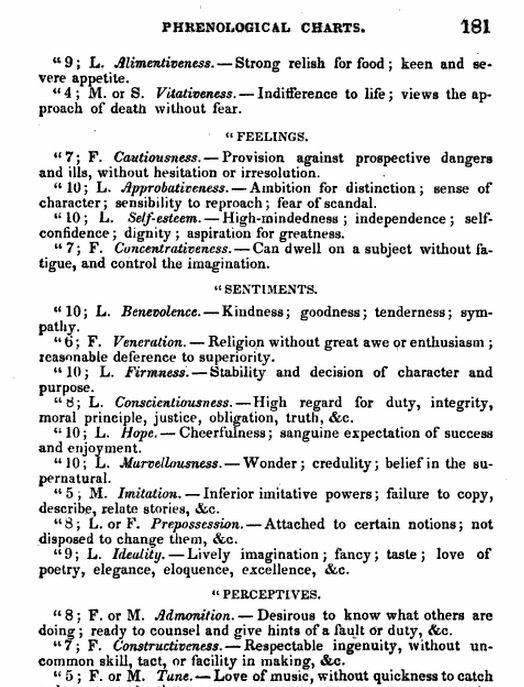 “Putting Character First: The Narrative Construction of Innate Identity in Phrenological Texts.” Victorians Institute Journal 38 (Jan 2010): 103-162. Gribben, Alan. 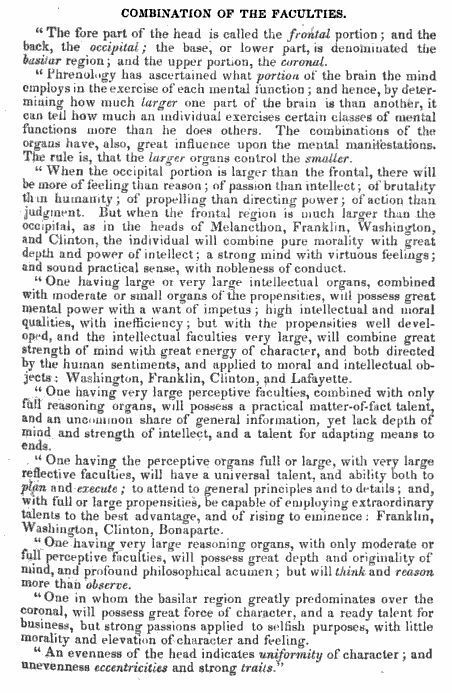 “Mark Twain, Phrenology and the “Temperaments”: A Study of Pseudoscientific Influence” American Quarterly 24.1 (Mar., 1972): 45-68. Hungerford, Edward. “Walt Whitman and His Chart of Bumps.” American Literature 2.4 (Jan., 1931): 350-384. Riegal, Robert E. “The Introduction of Phrenology to the United States.” The American Historical Review 39.1 (Oct 1933): 73-78. Stern, Madeline B. “Mark Twain Had His Head Examined.” American Literature 41.2 (May, 1969): 207-218. Wrobel, Arthur. 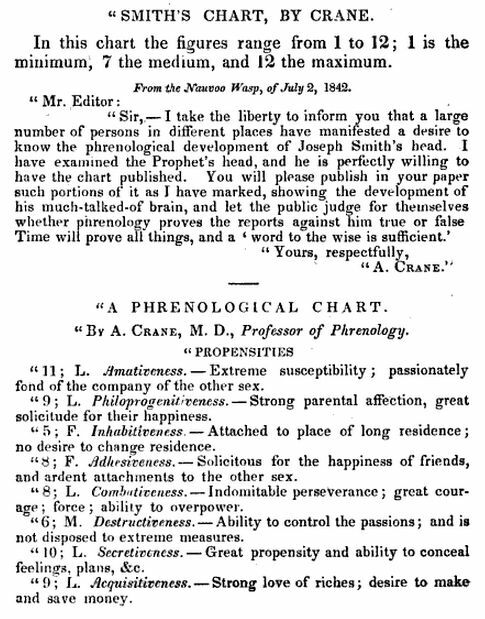 “Corroborating His Phrenology”: The American Phrenological Journal, The Great American Crisis, and U. S. Grant. Journal of American & Comparative Cultures (24.3-4): 161-169. You are currently browsing the Skeptical Humanities blog archives for May, 2013.